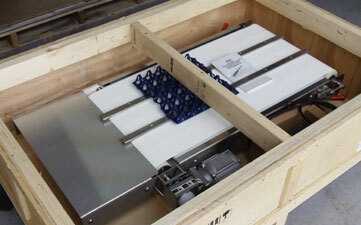 Belted conveyors are used to transport product between two or more locations. 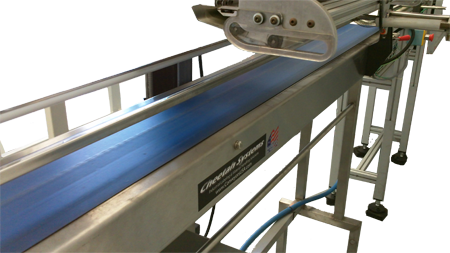 The variety of products a conveyor system transports ranges from bolts to boxes - everything for distribution and manufacturing systems. We specialize in conveying boxes, packages, bags, and many other items found in today's distribution and manufacturing environments. Our expertise extends into many different industries including but not limited to food processing, pharmaceuticals, pet foods, computers & electronics, automotive parts manufacturing and consumer goods. With a wide array of previous application experience Cheetah Systems will provide the best possible solution for your application. Wash down stainless steel, painted steel or powder coated frames are available. Drive configuration will vary depending on user environment and product specifications. A wide variety of logistical devices are also available including physical stops, pushers, counters and PLC controls for system integration and product flow issues. Give our technical sales staff a call today to discuss your application. Cheetah Systems engineers are available to assist you with all of your company's material handling, packaging, or Labeling requirements. Give us a call today at 727-217-6719 or email us at sales@cheetahsystemsllc.com.